Finding the time to play it has been tricky in recent weeks but I’m far enough in to offer an opinion on the FM Towns port of Wing Commander. When I started, I was hoping it would be the definitive version of the game. Having reached the end of Secret Missions 1, I’d struggle to call it either way as it gains in some areas and loses in others. It doesn’t win out anywhere else however. Graphically, it looks identical to DOS but the speed of gameplay and animation is much slower than you might expect on the FM Towns given that the original Wing Commander would run on a 286. The cutscenes are particularly slow and jerky. 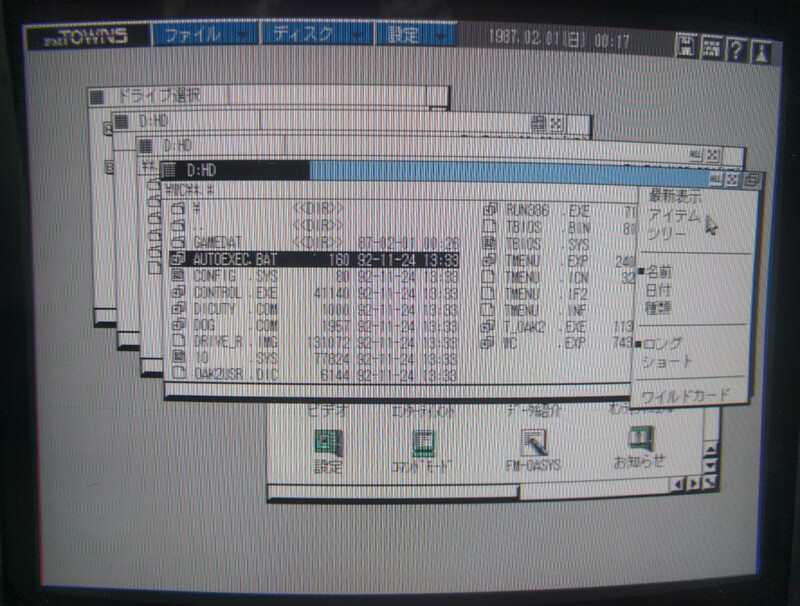 The FM Towns has some extremely capable sprite hardware which is clearly being entirely ignored in this port. Surely adapting the Origin FX engine to use the hardware would have been relatively straightforward. Games like Viewpoint or Tatsujin Oh pushing sprites all over the screen show just what is possible on even the slowest FM Towns machines. 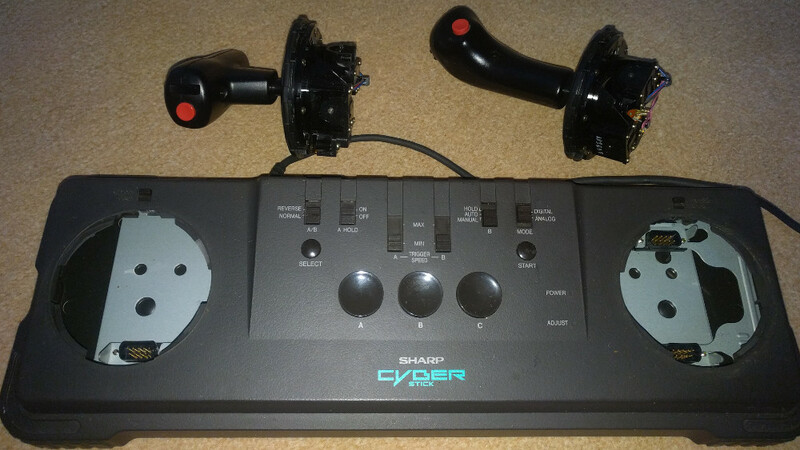 Ports like this don’t exactly show an expensive bit of hardware at it’s best and it might be one of the reasons Wing Commander never took off in Japan. When you get in the cockpit, the game runs reasonably well at standard clock speed for Wing Commander 1, if still a little less smoothly than I might have liked. When it came to the Secret Missions levels though, it slows to a crawl and I’ve had to run the machine in turbo mode. At this speed, the gameplay is fine but the cutscenes now whizz by in fast forward and the mouse is uncontrollable so I have to use the joystick to move around between missions. I’ve played the final mission of SM1 below (in turbo mode) which gives an idea how this plays on the 486SX 25 Mhz version of the Towns. The only way to get a half decent picture on my phone was to play this in the dark. One of these days I might buy myself a decent camera for this job but it hasn’t happened yet. Using a strange foreign keyboard with extra keys when I couldn’t see which key was which gave me no end of grief as you will notice but I made it through the mission…. just. With turbo on, Wing Commander does play pretty well apart from occasional glitches where the music randomly switches itself off. These may be to do with using a 25 year old CD drive but I’m not convinced and they only seem to happen when turbo is on. I’m sure I could have got the DOS version working at a more consistent speed and it certainly didn’t need a 486 for a decent framerate. I’m left with the impression that the FM Towns got a bit of a quick and lazy port and the results are far less than they could have been. Having said that, the Towns does have the power to get away with it so this is still a decent version of Wing Commander by any standards. Maybe it outstrips the original because of the sound but they are similar enough that there really isn’t much to choose. Wing Commander isn’t really the reason to own an FM Towns but it’s been a good excuse to play it again if nothing else. I’d forgotten how tough those Secret Mission campaigns were. There was also a port of Wing Commander 2 which I’ll be trying out next, but first I have to finish SM2. 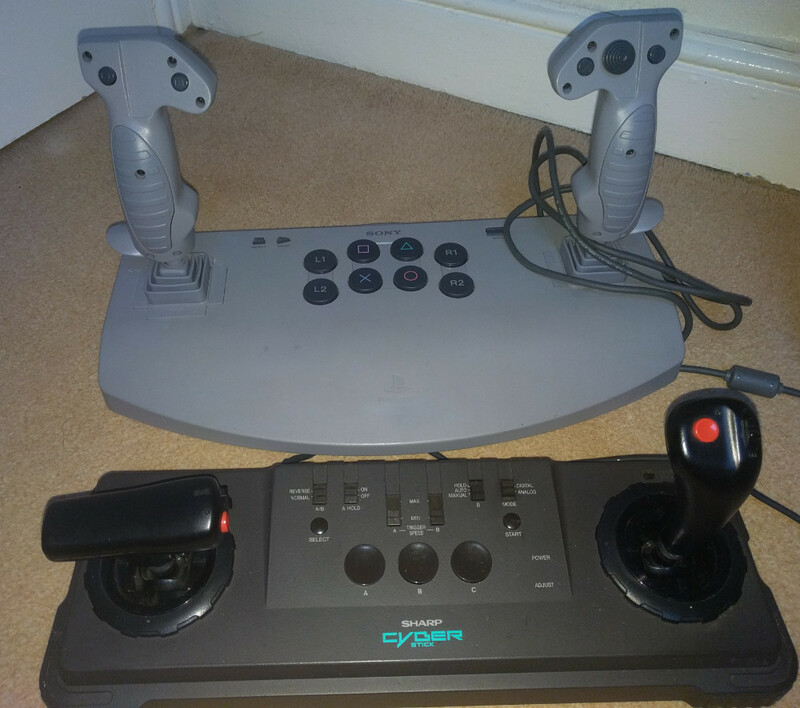 All my recent posts have been dealing with getting an FM Towns II computer in a suitable state to play Wing Commander. In the last of these I took a quick look at the analog controller I’ll be using and prior to that managed to upgrade the RAM from 2 to 10Mb. This time I’m dealing with the matter of getting a hard disk drive up and running. This is a 2Gb IBM drive pulled from a laptop. 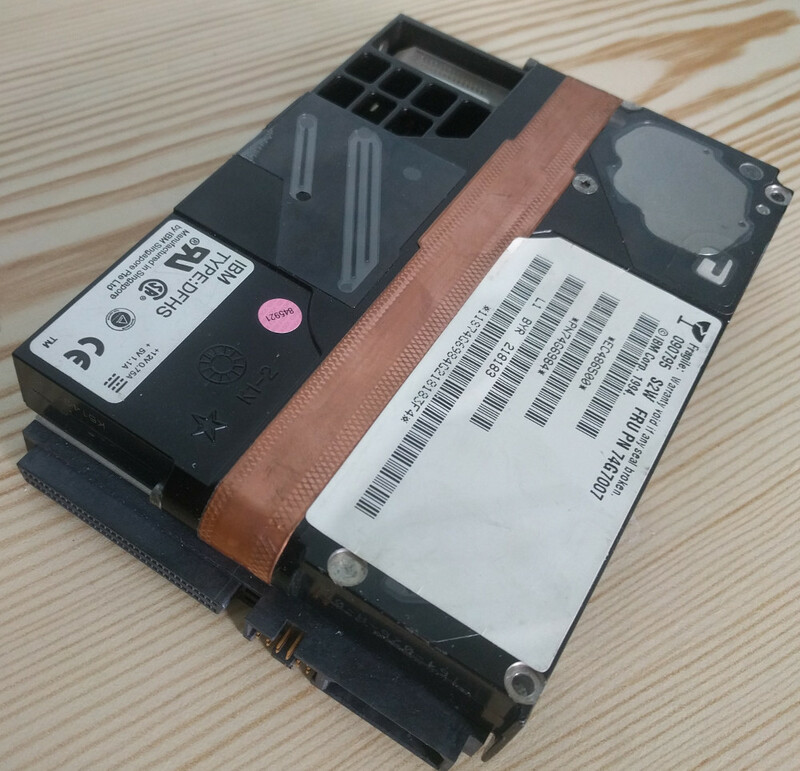 It’s a SCSI-3 device with a 68 pin half pitch connection on the back. I found plenty of manuals on the web and tried various jumper settings on the hard drive (of which it has many) but was unable to get anywhere at all with it. Initially I was trying to set the drive up using a Towns 2.1 OS boot disk that came with the machine but found another guide on hard disk installation at http://illusioncity.net/guidefm-towns-how-to-create-and-format-an-hd-image-and-install-dos-with-cd-support/ . The snag with this guide is that I needed to create a DOS boot disk and the Towns doesn’t even use a standard 1.44Mb format. I’ve managed to source a complete download of near enough everything released for the FM Towns (not one I can share unfortunately) which included the DOS disk images. To write a disk I had to connect up a 3.5 inch floppy drive to my modern PC and used a program called Omniflop. 1.44Mb floppies appear to work fine for this purpose. Omniflop is an old program but works perfectly in Windows 10 at least at the time of writing. It’s a simple enough process – just follow the instructions at http://fullmotionvideo.free.fr/phpBB3/viewtopic.php?f=5&t=1187. The working boot disk didn’t actually help out as I still couldn’t detect the hard disk from the setup program. I clearly needed another plan so searched the web and came across the SCSI2SD device. This is one of those fantastic modern gadgets that makes retro computing so much less grief than it would have been a few years back. It emulates up to 4 SCSI devices at once including hard drives, CD-ROM and floppies, storing all the data on a swappable micro sd card. I ordered mine from Amigakit where it’s currently listed as SCSI to Micro SD Interface Adapter. I was slightly wary about this as there is a long list of supported devices on the Wiki which doesn’t include the FM Towns but it seemed the best shot. I also ordered a case for the device from Ebay. 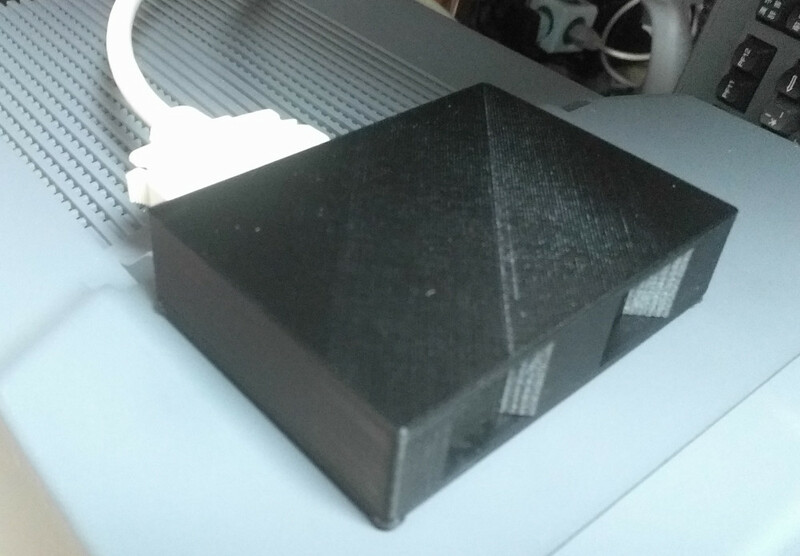 These are 3D printed and include the cabling on the inside to connect to the board. This one has a 50 pin half pitch connector on the back. I can’t honestly say I’m too impressed with the quality of the case but it does the job. Just don’t expect to be able to get the SD card out without tweezers. You don’t want to take this thing apart too much either as the screws had barely any purchase on the first assembly. 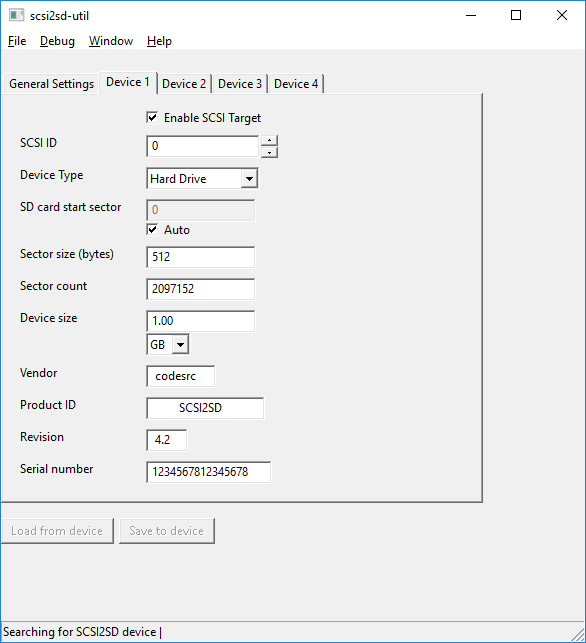 Setting up the SCSI2SD is a matter of sticking in an SD card, connecting it to your PC with a USB cable, running the utility software and selecting a drive size. I set up a 1Gb drive but found out afterwards that Towns DOS won’t take partitions over 127Mb. You can set up multiple partitions on one large drive if you wish and there are different file table formats that you may be able to use if you know what you are doing. I stuck with MS-DOS since I know it will work. There is no fdisk to partition hard drives on the towns and the system has a more all-encompassing setup program instead. The illusioncity guide linked above details what you need to do, although you can do the same job in Towns OS 2.1 by the looks of it. I’m glad to say that the Towns detected the SCSI2SD without any problems whatsoever and I was soon up and running. The power is drawn directly from the SCSI connection so there is no need for any power source other than the Towns itself. That just leaves the matter of actually installing Wing Commander. I would like to think there would have been an installation program but the extra instruction sheet bundled in with the game says to manually copy all the files to your hard disk from the CD. This proved more tricky than it sounds since I’m dealing with an unfamiliar operating system in a foreign language. My first thought was to use DOS since the commands are the same. This appeared to be going OK until I noticed how just many different subdirectories I was going to have to copy one by one (there is no xcopy command on my DOS disk). I swapped to Towns OS at this point. The file browser on this defaults to just showing some icons to run programs rather than the actual file structure. After randomly trying options, I realised that you can swap to showing the files by clicking the double folder icon at the top right of the window and selecting the second option down. After this point it’s a case of drag and drop. Wing Commander can then be started by running wc.exp and apparently defaults to English which is just as well. It’s been a longer journey than I anticipated getting to this point but I’m there at last. I highly recommend Google Translate for anyone messing around with one of these machines that doesn’t have much Japanese. My phone struggles at times to pick up the screen clearly but it’s meant I’ve been able to decipher the menus in Towns OS and work out all the basics. 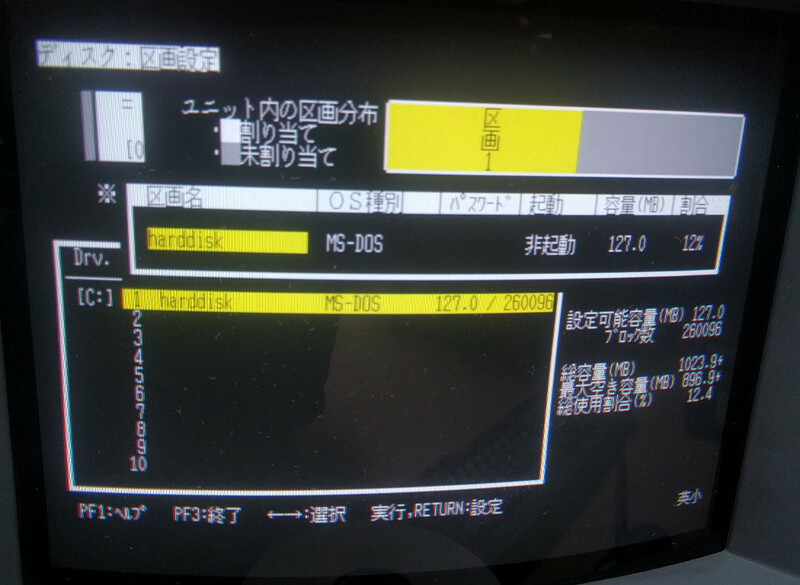 I do still have to set up the hard disk every time I start the machine since I need to replace the BIOS battery. This would be no small task in one of these things and would mean complete disassembly of the machine and probably soldering the new battery in place. I’ll leave that job for another time (if ever). For now, it’s about time I played some Wing Commander. I’m still trying to get my FM Towns in a state to play Wing Commander. It might help if I hadn’t spent so much time playing Truxton 2 on it but I have made some progress this weekend. The main problem I’m having is the lack of information and what there is often conflicting. As such, I thought I’d share what knowledge I do gain starting today with the memory upgrade. My FM Towns II (like most of the models) comes with 2Mb of RAM. This was quite a lot for the time but that single speed CD-ROM drive just isn’t up to loading data on the fly (as shown in the fairly painful first attempt with Wing Commander a couple of weeks back). I gather some machines support EDO RAM, provided you set the appropriate jumper on the motherboard but I opted for what I hoped was the safe option of buying some 8Mb 70ns FPM, Non-Parity SIMMS from Ebay. Early FM Towns machines are limited to 8Mb SIMM’s as a maximum. I expect that’s not the case with my FM Towns II but 10Mb sounds like plenty for the games I have in mind. The upshot is that pins 67-70 on the SIMM chip are used to report the size and speed of the SIMM in question. The IBM compatible chips use a completely different standard to those on the FM Towns so a bit of finagling is required. Fortunately, this is fairly easy to achieve with a soldering iron even for me. The table above (stolen from the forum post) shows the settings required with O being the pins that should be connected. Most (but not all) SIMM’s will have somewhere on them pairs of solder points for this purpose. The jumpers in question are at the top right of the chip I’ve used here. R1-R4 represent pins 67-70 in order. R3 was already bridged with a little connector. From the chart above, I also needed to connect R2 and R4. I just filled the gaps with a bit of solder and I’m pleased to report that my FM towns now detected the memory correctly on boot. I should mention that the first chip I tried still refused to work as it didn’t pass the memory tests at startup. It may well just have been a faulty chip but I’ve heard that some SIMM’s can prove to be incompatible. The one that did work is an HP D2975A which is available on Ebay for under $3. As far as improving Wing Commander goes, the difference is marked. During cutscenes, the extra memory appears to largely used as a cache, so the first time a given character or scene is shown it is still slow to load but once you have played a mission or two the CD isn’t even accessed most of the time. Gameplay itself is all pre-loaded before the mission and the game is so much more playable now, albeit with a really, really long loading time for that first mission. It’s still quicker than playing Wing Commander 3 on a 486 was. I’m going to be needing that hard disk if I’m ever going to play Wing Commander 2 as it requires installation to run at all. I have the hard disk but am still waiting on the SCSI cable to try it out. One hitch I know is coming is that the BIOS battery on this thing is long dead and it appears I will have to completely dismantle the machine to get to it. The hard disk will need setting up every time I switch the machine on if I don’t fix this but I might just live with it depending on how much grief it causes. I definitely want to get the hard disk up and running first.. The main thing that is keeping me from a Wing Commander playthrough is that I really don’t much fancy using the keyboard to play the game. The solution to that problem is being delivered next week so providing it works I hope to have this fully up and running before too much longer.